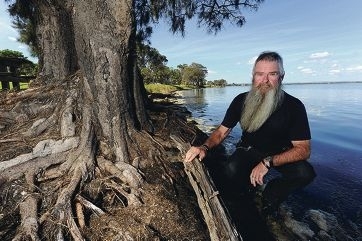 Mrs Warner said Mandurah City Council extended a section of shore 130m in Placid Waters and now the roots of some trees (near Kurdal Road) were in salty water. ‘The water level increased and 12 trees are going to die,’ she said. Mr Warner said the trees were symbolic in the area and should be protected. ‘The shore line is rapidly being eroded,’ he said. ‘Council should place rocks around the trees and infill around them. City of Mandurah chief executive Mark Newman said the erosion of foreshore reserves and shorelines was an ongoing problem that council was tackling. To help combat the problem, a policy framework has been developed to strategically assess priority areas and recommend strategies to address estuarine and riverine erosion. ‘The work currently being undertaken at the Coodanup foreshore has a number of objectives, including protecting the trees on the reserve, protecting against future erosion and reclaiming the recreation space which has been lost due to erosion,’ Mr Newman said. ‘The area being worked on now has been identified as one of the priority areas for erosion control. Mr Newman said the foreshore itself had not been extended into the water, rather the 5-10m of lost recreation space had been backfilled or reclaimed after the rock wall was built up to the city’s boundary. ‘The extension of the rock wall has not led to increased water levels, however this may be due to recent storm surges and tidal influences,’ he said. ‘Some of the trees on the reserve already have rocks around their bases, however this may not always be the most effective option as water and waves can move under the rocks and cause further erosion at the tree base.